The biofuels market could become overloaded with ethanol as more producers worldwide jump into the game, and as more bio-feedstocks -- including cellulosic biomass -- can be efficiently converted to ethanol. But ethanol may well be more valuable as a chemical feedstock than as a fuel. A growing substitution of bio-ethanol for petroleum in the production of chemicals, plastics, fuels, lubricants, etc. will only extend the world's supply of petroleum that much further. Researchers at the Department of Energy’s Pacific Northwest National Laboratory (PNNL) and Washington State University (WSU) have developed a new nanosized ZnxZryOz mixed oxide catalyst for the direct and high-yield (83%) conversion of bio-ethanol to isobutene, a widely used intermediate chemical used for the production of fuel additives, rubber and solvents. ...The PNNL and WSU researchers had been trying to make hydrogen from ethanol. To improve on a conventional catalyst, they had taken zinc oxide and zirconium oxide and combined both into a mixed oxide—the zinc and the zirconium atoms woven through a crystal of oxygen atoms. Testing the new material, PNNL postdoctoral researcher Junming Sun found not only hydrogen, but unexpectedly quite a bit of isobutene. 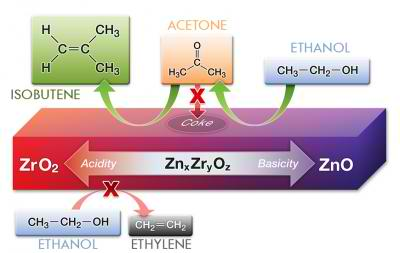 Investigating the catalyst in greater depth, the researchers found that a catalyst made from just zinc oxide converted the ethanol mostly to acetone; if the catalyst only contained zirconium oxide, it converted ethanol mostly to ethylene. Isobutene only arose in useful amounts when the catalyst contained both zinc and zirconium. Zirconium oxide is capable of converting acetone into isobutene; for the isobutene yield found, however, something would have to prevent zirconium oxide from turning ethanol into ethylene. The team reasoned the isobutene probably arose from zinc oxide turning ethanol into acetone, then zirconium oxide—influenced by the nearby zinc oxide—turning acetone into isobutene. At the same time, the zinc oxide’s influence prevented the ethanol-to-ethylene conversion by zirconium oxide. Although that’s two reaction steps for the catalyst, it’s only one for the chemists, since they only had to put the catalyst in with ethanol and water once. To get an idea of how close the reactions had to happen to each other for isobutene to show up, the team combined powdered zinc oxide and powdered zirconium oxide. This differed from the mixed oxide in that the zinc and zirconium atoms were not incorporated into the same catalyst particles. These mixed powders turned ethanol primarily into acetone and ethylene, with some amounts of other molecules and less than 3% isobutene, indicating the high isobutene selectivity of their catalyst came from the microstructure of the mixed oxide material. The researchers explored the microstructure using instruments and expertise at EMSL, DOE’s Environmental Molecular Sciences Laboratory on the PNNL campus. Using transmission electron microscopes, the team saw that the mixed oxide catalyst was made up of nanometer-sized crystalline particles. If PNNLs catalyst can provide high enough yields at economic prices, commercial producers should be willing to license the technology. Did you notice from the excerpt above, that the researchers were initially working on a grant to turn ethanol into hydrogen, when they unexpectedly discovered the isobutene by-product? Only then did they proceed to fine-tune the catalyst to maximise isobutene production. "Accidental science" is one of the most prolific producers of new tools, technologies, and scientific theories in existence. That is one reason it is so difficult to predict future discoveries and breakthroughs.